Seabirds often live in large colonies in very confined spaces. Parasites, such as fleas and ticks, take advantage of this ideal habitat with its rich supply of nutrition. As a result, they can transmit blood parasites like avian malaria to the birds. Scientists from the Max Planck Institute for Ornithology in Radolfzell and a team of international colleagues have investigated whether this affects all seabirds equally, and whether climate conditions, the habitat or particular living conditions influence infection with avian malaria. They discovered that most seabirds are free of malaria parasites; however, some groups, especially frigatebirds, are particularly common hosts to malaria parasites. Although there is a link between warmer temperatures and increased rates of infection, not all tropical seabirds are infected. The risk of infection within a habitat increases for species with longer fledgling periods and specific types of breeding grounds. Seabirds exist in locations as varied as the Antarctic and tropical oceans. However, they all need land for breeding grounds. In order to protect themselves against predators or due to a lack of suitable breeding places, they often form large dense colonies. As a result, they provide blood suckers like fleas, ticks and bird lice – wingless insects which live in the plumage and feed on the birds’ feathers and blood – with a plentiful supply of food and a habitat. Therefore, these insects can arise in large numbers in such colonies. These small pests also survive well in cold climates such as that found in the Subantarctic, and are not particularly specialised in their choice of food, something the researchers know from their own painful experience. Other blood-sucking insects, like mosquitoes, are present mainly in warmer climates, as found in the tropical breeding grounds. Because mosquitoes are among the main transmitters of the Plasmodium genus of avian malaria, the researchers from the Max Planck Institute for Ornithology and their colleagues from Spain, France, Mexico and the US investigated whether infections of avian malaria differed in seabirds from cold and warm marine areas. To do this, they analysed blood samples from seabirds from different regions for parasitic infections using genetic methods. “We were surprised that the climate differences had less impact on the transmission of blood parasites than expected,” says Petra Quillfeldt. “More vectors live in warmer climates; therefore, we would have expected to find a higher rate of infection in tropical locations. We discovered, however, that different species living on the same island under the same climate conditions can display very different rates of infection.” The researchers defined several seabird groups that regularly carry malaria parasites. Frigatebirds were found to be particularly affected here, as all five species of this tropical seabird family are frequently infected. “Of five seabird species present in the seabird community on Christmas Island in the tropical Indian Ocean, only the Christmas Island frigatebirds were found to be malaria hosts. Over half of the island’s frigatebirds were affected and, moreover, with three genetically different malaria lines of the subgenera Haemoproteus and Parahaemoproteus, one of which was a completely new strain. As opposed to this, tropical birds and three species of gannet on the same island were not infected at all,” explains Petra Quillfeldt. Furthermore, the scientists have failed to find any blood parasite infections in other seabird groups, such as skuas and auks. Their research has led to the conclusion that the likelihood of infection depends, among other things, on the lifestyle of the birds: species with longer fledgling periods and hole-nesters are particularly severely affected. 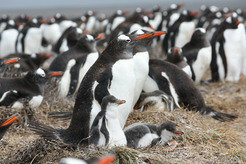 This is the first study of this kind to examine seabirds in all climate zones. It has shown that different factors can influence infection with malaria parasites. The study also raised new questions: The researchers would now like to gain a better understanding of the life cycles of the malaria parasites and their transmitters, as well as discover which mechanisms are responsible for susceptibility to infection among the different species.